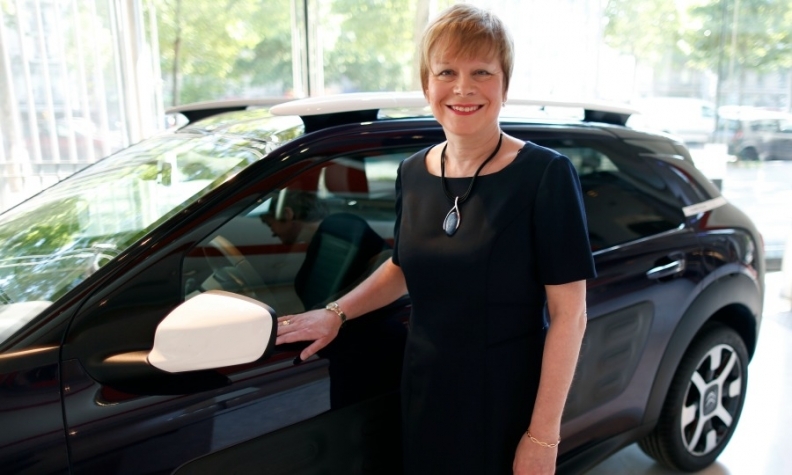 Citroen CEO Linda Jackson knows she won't reach her goal of having half of the brand's sales come from China next year. A big reason for that was Citroen's late arrival to the hot SUV segment. Jackson explained what happened and shared her new China target with Automotive News Europe Correspondent Nick Gibbs. Why do the Chinese get the C5 Aircross SUV this year while Europe waits until 2018? It's part of the core model strategy of giving every region a new car every year. When you launch more than one vehicle it can become complicated and it increases the danger that you miss something in terms of the quality. In Europe, we will have the C3 Aircross [subcompact SUV] this year, then at the end of next year the C5 Aircross will debut. China will get the C3 Aircross next year. You said in 2015 you wanted 50 percent of Citroen's sales to come from China by 2018. China sales fell 17 percent last year. What is your target now? Unfortunately, I'm at 35 percent and I've decided I need to get to 45 percent by 2021. My ambition is still to get to 50 percent. We've done very well growing volume in Europe, but we've struggled in China. In 2015 China was our largest-single market, now it's back to being France. We have suffered because we didn't have the right products. Four years ago, our sedans were absolutely right for China. Then suddenly SUVs took off, Chinese manufacturers came in and there was a price war. We weren't willing to enter the price war. Main Challenge: Leveraging Citroen's long-awaited rollout of SUVs to rebuild the brand's falling sales in Europe and China. How do you counter the growth of the Chinese brands? We're restructuring the dealer network and now we're launching SUVs. You need the right product for the market, an efficient dealer network and you have to have a very strong brand. How do you market the brand in China to keep it strong? We're using the same marketing material used around the world but it is adapted to Chinese tastes. It's about being on TV, using big posters, marketing regionally and concentrating on digital. It's all about focusing on the product. Will SUV demand continue to grow? Every forecast we see says the SUV is continuing to expand everywhere. The question is: Will it end? I don't believe the customer is moving completely to SUVs, but there are certain SUV attributes that customers are looking for -- robustness, driving position -- and I think that will continue. But I don't think they will overtake and replace everything. What will your SUV share be in two years and how will that affect your bottom line? Of our eight core models, two of them will be SUVs. That's part of how we will increase volume by 30 percent by 2021. SUVs will play a very important part and clearly they are very profitable for any manufacturer. They will represent a very important part of our margin. But you need to be careful the SUV market doesn't become saturated. When will you stop selling the C5 midsize model line in Europe? Production ended last month. I think we need a replacement but it's not my priority. I would need it internationally. I don't want a car that's purely for China or purely for Europe. I decided to first prioritize SUVs. For the next couple of years we'll be launching SUVs, and maybe something a little bit extra. Then we will move onto the sedans. How is Citroen keeping pace with mobility trends such as car-sharing? We're currently testing several car-sharing schemes, such as Multicity in Berlin using  C-Zero electric cars. We're also in Madrid, Lyon and Bordeaux. We're still testing it. Nobody's certain where it's going to go yet. Everybody wants to say they're doing it. Everybody's testing it, but nobody's making enormous numbers out of it. What kind of future do you predict for car-sharing? If you're in a major city, there's a real benefit from car-sharing. However, research we've done shows that people still want to own their own car and don't want to share with someone else. There's an expectation that the two will live side by side. PSA's purchase of Opel adds a third mid-market brand. Will it be crowded? I can't answer questions on Opel because we're currently in due diligence [Citroen parent PSA Group aims to complete its takeover of Opel before the end of the year]. Clearly, a fourth brand will stand by the other three brands. How that pans out is up to the Opel team to express themselves once we've finalized all the legal requirements.